“As a young lad, Old Mr Anorak liked to settle down with his junior pipe and slippers, reach for his monogrammed Gurkha knife, and cut open a paper packet of Wonderful World of Soccer Stars stickers. This allowed the owner to turn to the correct page in the album, and stick it in the box allocated to the player. The picture could now be lifted up, and a short biography could be studied. These were written in a brusque, formal style, with its own special jargon. Players were “a local product,” and a debut was often referred to as a “bow”. A midfielder might be referred to as a “schemer”. This didn’t mean he plotted dressing room rebellions; it referred to his ability to spot and deliver a pass. (Although in the case of hatchet-man Trevor Hockey this might refer to conspiracy to maim.) 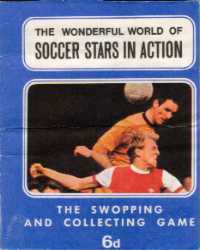 Arsenal’s Ian Ure, on the other hand, was described as a “fair-haired Scottish pivot”. You’d get locked up for that kind of thing nowadays. But the strangest thing about these collectables was the pictures themselves. They were photographs, but in many of them the team strip was painted on. 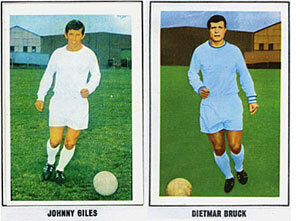 Most of the time this merely resulted in a dizzying effect – the 1969-70 Blackpool squad, for example, looks radioactive. In other celebrated cases things were stranger still. Old Mr Anorak, as a keen Crystal Palace fan, was keen to see Alan Birchenall and Bobby Tambling, two star summer signings. Imagine his surprise when their previous club badge and shorts markings were clearly visible beneath the Palace colours. Had Palace run out of kits and resorted to dying the players’ old strip? No: the publishers had simply painted over two old Chelsea pictures. This was a common practice and it sometimes resulted in carelessness. 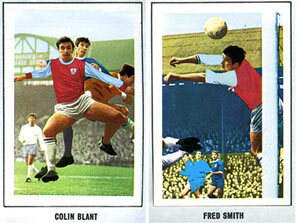 Burnley’s Fred Smith “had to wait seven years for a regular place,” despite the fact that his club appear to be playing two matches at the same time – one against opponents in navy shirts and one against a team in a dangerously dazzling blue. Meanwhile it’s just as well that Colin Blant was a “strong defender,” as he seems to be battling against three different teams at once – one in blue, one in red, and one in white.